Don’t miss this new play written and directed by Laurence Allan, opening in Aberdare Coliseum on Thurs 23rd – Fri 24th April 2015 and touring Wales until 16th May. In 1895, before the Tour De France and before the Modern Olympics, Wales and Aberdare could claim its first cycling world champion when Arthur Linton won the Bordeaux to Paris bike race, 350 miles – the blue riband event of the cycling world. Within weeks, he and his controversial trainer, Choppy Warburton were embroiled in the sport’s first drugs scandal and within a year Arthur at the age of twenty­four was dead. He was one of the “Terrible Three’, a trio of world class cyclists from the Cynon Valley who took on the world’s best and left behind scandal, myth and memories of the legendary first racing bike – The Gladiator. 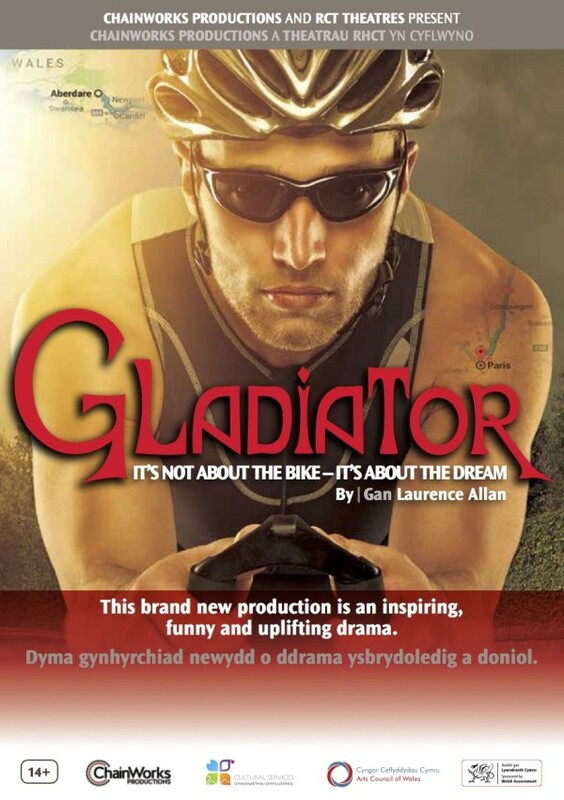 Gladiator is a drama that uncovers this amazing story through the eyes of a modern family living in Aberdare. Jimmy and Jenny are twins celebrating their eighteenth birthday in different ways and with different aspirations. Jenny has dreams of the catwalk in Paris but works on the make­up counter in Boots in Ponty. Jimmy thinks he’s a warrior in search of honour and dignity but is afraid to leave the attic and his Gladiator computer games. All things change when Jimmy’s attic world literally collapses around his head revealing a Pandora’s Box from the past including an ancient bike and an even more ancient stranger in Victorian underwear. Choppy Warburton has returned in search of redemption and soon Jimmy is reliving the legendary bike race from Bordeaux to Paris on the ancient Gladiator, looking for honour and dignity with Choppy as his Svengali like trainer– all within the confines of an Aberdare attic. Wed 29 ­- Thurs 30 April Chapter Cardiff 029 2030 4400.